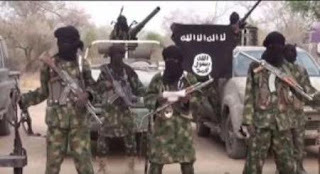 The terrorists group, Boko Haram, on Saturday attacked the Borno town of Magumeri, some 50 kilometers from Maiduguri, the Borno State capital. It was gathered that the town had been taken over by the terrorists group. According to reports, residents said the group invaded Magumeri, at about 7.00 p.m., shooting sporadically, throwing explosive devices and making the people of the town to flee. “We hurriedly took our families to the bushes before they could get us. Almost every resident is hiding here,” said Wakil Bulama, one of two residents who spoke to Reuters on telephone. Boko Haram has waged an insurgency in northeastern Nigeria since 2009 in its attempt to create an Islamic state in the region. The group has killed more than 20,000 and forced around 2 million people to flee their homes. The attack comes less than 48 hours after a suicide bomber killed at least 50 people at a mosque in neighbouring Adamawa State in one of the deadliest attacks since President Muhammadu Buhari came to power in 2015 pledging to end the eight-year insurgency. 0 Response to "Boko Haram takes over Borno town"